Neocon warhawks have clearly failed to learn the lessons of the recent past, as those in the Trump Administration continue to beat the drums of war with Iran. The neocons include Secretary of State Mike Pompeo, who would be happy to create a famine in Iran, and National Security Adviser John Bolton, who has talked openly about undermining and ultimately overthrowing the Iranian regime. Pompeo has warned Iran that if it wants its people to eat, it should bow to Washington pressure. Those neocons have in their corner Israel, Saudi Arabia, and its Arab partner in the Yemen war, the United Arab Emirates. In the opposite corner are Russia, China, and most NATO nations, including Turkey. This standoff is having the effect of isolating America from its historical allies in Europe and from the world at large. The global consensus is that Iran has played by the rules since it signed the 2015 Joint Comprehensive Plan of Action (JCPOA), better known as the Iran nuclear deal. President Donald Trump abandoned the deal to please Israel and the Saudis, as well as members of the Benjamin Netanyahu cheerleading group of politicians on both sides of the aisle in Congress. Trump broke from the agreement, knowing there was no evidence to show that Iran was in breach of its promise to discontinue uranium production. His plea to the other signatories to the deal—Britain, China France, Russia, and Germany—to follow his example was rejected. Those nations felt that Iran had abided by its promises to not pursue its nuclear ambitions and ought to be rewarded by not having new sanctions imposed on it. The CIA in Iran: The 1953 Coup and the Origins of the US-Iran Divide, $15 from the AFP Online Store. Trump felt otherwise, yet overestimated his powers of persuasion because his partners not only opposed his actions, but have since been putting in place a mechanism to undermine his sanctions. A financial tool known as a “special purpose vehicle” (SPV) has been created by EU nations to operate in Paris or Berlin with the objective of undercutting the sanctions. The SPV will allow Iranian companies to do business with European companies without going through the traditional banking system. Instead, they will employ bartering and credits, which Russia will also use. Meanwhile China and India have made it clear they will not abide by U.S. attempts to crush the Iranian economy. In contrast, Israel has promised Trump that its intelligence agency, Mossad, will help to make the sanctions work, and the Saudis have assured him they will pump more oil to account for the loss of Iranian oil, which cannot be sold on the markets. They hope this will stop oil prices rising. The Israeli and Saudi roles in the sanctions policy appear to confirm their prominent involvement in shaping U.S. foreign policy. Many experts see the sanctions as the first step in a wider push to force Iran into a conflict, an outcome Netanyahu has been hoping for and the Saudis would embrace as well. Such a conflict by most estimates would quickly engulf the region and beyond. Oil supplies would be halted, creating chaos in the international markets, and American military, political, and economic assets would be at risk in countries like Iraq, Lebanon, and some Arab states. The reason why some observers worry that the U.S. may be heading for a war with Iran is that Trump, his pro-Israel lobby in Congress, and the Saudis naively believe that sanctions will bring Iran to its knees. When sanctions fail, as they likely shall, neocons like Bolton and Pompeo will come under pressure from Israel and its Washington backers to pursue military options. The American people will likely oppose a war with Iran, knowing our history in recent conflicts and the overarching evidence that this one would be launched to please Israel and Saudi Arabia, unless, of course, some event were to occur that could be blamed on Iran to enflame U.S. public opinion. Sanctions represent failed policymaking, especially when they are unilateral like these are, unsupported by all the major players to the Iran deal, including the EU, one of the world’s largest economic blocks. For example, as far back as 1997, a report showed that U.S. sanctions were effective only 13% of the time and more often than not cost the American economy hundreds of thousands of jobs and tens of billions of dollars. As Canadian newspaper The Globe and Mail put it in May, sanctions have winners and losers. A war with Iran would be opposed by the international community as well, especially in light of the fact that Iran has stayed true to the nuclear deal. It is already apparent that Trump’s decision to abandon the deal was driven by his closeness to Netanyahu and the Saudis. 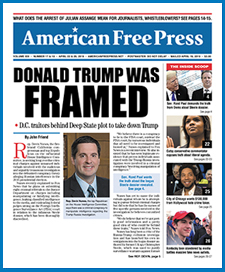 This timely article was originally published in American Free PressIssue 37 & 38, Sept. 10 & 17, 2018, shortly after the White House decertified the nuclear accord with Iran. It is published here with a podcast from S.T. Patrick’s “The Midnight Writer News Show” featuring James Perloff. The two discuss Donald Trump’s foreign policy from 2016-2018, the 2016 election, Russiagate, and Vladimir Putin, why the media was so wrong about the 2016 election, the real purpose of America’s two-party system, using an enemy to reorganize a political party, neoconservatism vs. North Korea, what’s really happening in Syria, why the Rothschilds hate monarchies, Iran, how Trump lost Perloff, whether Trump is really against the Deep State, and more. After deliberately upsetting U.S. relations in the Middle East by disavowing and then decertifying the 2015 Iran nuclear deal, the Trump administration enacted the first round of sanctions against the Islamic republic. While Secretary of State Mike Pompeo threatened that the whole of the sanctions will be the “strongest sanctions in history,” the world powers that assisted Barack Obama’s administration in its negotiations with Iran—the United Kingdom, Russia, France, China, and Germany—are prepared to rebel. In an Aug. 7 tweet, President Donald Trump called the sanctions “the most biting ever imposed” and vowed to “ratchet up” the economic restrictions in November. What are meant to be sanctions against Iran will also serve as de facto sanctions against countries that have forged successful business relationships with the most populated country in the Middle East. The first round of sanctions seeks to end Iran’s ability to trade with U.S. dollars, as well as its trade for cars, metals, and minerals used to buy American and European aircraft. In November, the U.S. will attempt to block 2 million barrels per day of Iranian oil exports, 50% of Iranian production. In response, Iran’s president, Hassan Rouhani, countered the country could block all oil exports from the region by closing the Straits of Hormuz, through which nearly one-third of all oil traded by sea passes. The CFR and the American Decline – Just $12 now at AFP’s Online Store. In July, Iran’s Supreme Leader Ayatollah Ali Khamenei commented on the suggestion that the Americans would attempt to block Iran’s crude exports. Rouhani, Iran’s political leader, displayed an even harsher tone when speaking to Iranian diplomats. Khamenei is not the only national leader wondering what American agreements mean if the stability of the agreement can waver with each president that assumes the office. Two weeks after the sanctions were enacted, China announced that it would buy Iranian oil, which would be shipped via Iranian tankers. China has clearly stated that it does not support the unilateral sanctions. France, conversely, has stereotypically caved to the American threats. Shortly after China’s olive branch was offered to Iran, the European Union revealed that it would send $20.7 million to Iran as part of an economic aid package that will total over $50 million. Neven Mimica, the EU’s commissioner for international cooperation and development, outlined the program’s mission. As is the case with seemingly every story during Trump’s first term, the world awaits a clear Russian response. Business Insider suggested that the Iranians could save face by negotiating through Russia, while Newsweek noted that the sanctions would be a gift to Russian President Vladimir Putin, as it would move the affected European nations away from the United States and toward Russia, the world’s biggest energy exporter. Washington’s Perilous War for Hegemony – Paul Craig Roberts at the AFP Store. The first Trump attack against Iran’s economy was against Iran’s central bank. The global banking elite that favor cooperation with the International Monetary Fund and the World Bank have advocated for the isolation of uncooperative central or national banks. Iran, Libya, and North Korea have, for decades, been targets of the elite debt slavery cabal that controls the strings of the world’s economic marionettes. “TheAmericanConservative.com” has bluntly stated that Trump is “pulling a Libya on Iran.” The U.S. had previously reneged on an agreement with Libyan president Muammar Qaddafi, with disastrous, violent results that ended with the attack at Benghazi, the brutal assassination of Qaddafi, and chaos in Libya. The Iran nuclear deal (officially called the Joint Comprehensive Plan of Action) required Trump to certify Iran’s compliance every 90 days. Iran had agreed to freeze all nuclear weapon development for 15 years in exchange for suspending the sanctions against Iran. By certifying, Trump was saying that Iran was living up to its end of the agreement. Though they were, Trump did not want to publicly endorse the idea that the agreement worked. Now, threats, violence, and unrest are ever-present throughout the region. Though the sanctions further destabilize an already fiery region, cause riots and rebellions from the Iranian families that will be hit early and often, and cast an even darker shadow over America’s tenuous alliances, Trump ended his Aug. 7 tweet with an Orwellian statement of intent. “I am asking for world peace, nothing less!” Trump tweeted.